Art Event. This shot is of my space at the show. 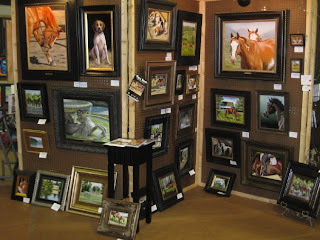 It was a great weekend full of meeting many friendly art show attendees and some new area artists. One of my favorite perks of doing these shows is getting to know the artists that are set up around you. It's a great way to connect considering that artists spend a lot of solitary time in the studio and the shows are a great way to catch up with each other. The people running the show at Lipscomb could not have been more kind or more helpful to the artists....that is so appreciated!